First–the good news! Thanks to the efforts of over 100 dedicated volunteers the 2018 terrapin nesting season has come to a close with our lowest number of depredated nests at this point in the season. It’s a group effort! 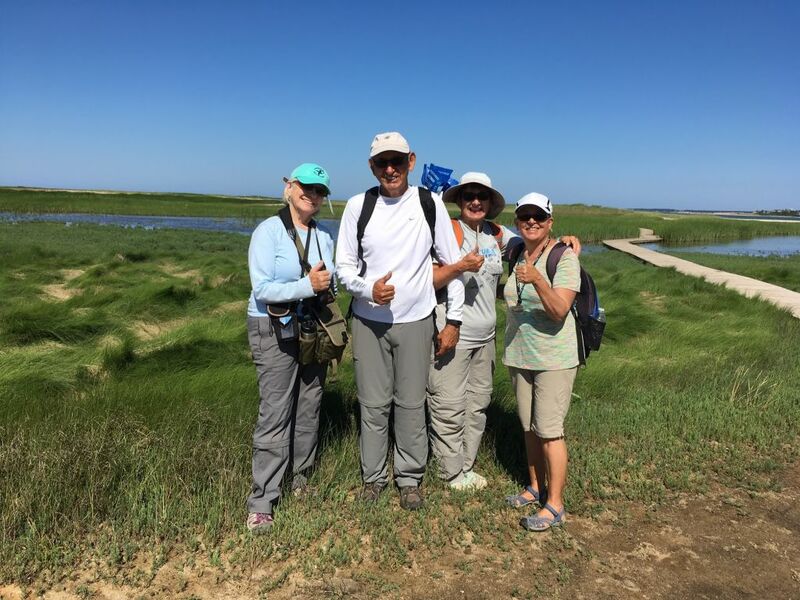 Volunteers Nancy Rabke, John Ogas, Sandy, Ogas, and Sue Reiher on nest patrol. (Photo courtesy of Sue Reiher). This year we protected a total of 335 terrapin nests in Wellfleet, Eastham, and Orleans. At WBWS we found a total of 57 nests: 56 protected and only 1 depredated (dug up and eaten by predators). Across the bay at Lieutenant Island 93 nests were found: 76 protected and 17 depredated (down from 40 this time last year). Elsewhere in Wellfleet, Old Wharf Road had 14 nests (3 depredated), and at Indian Neck and Great Island, 107 nests were located (45 depredated). In Orleans, a record number of nests were found at White’s Lane– 13 protected nests with no depredations so far! 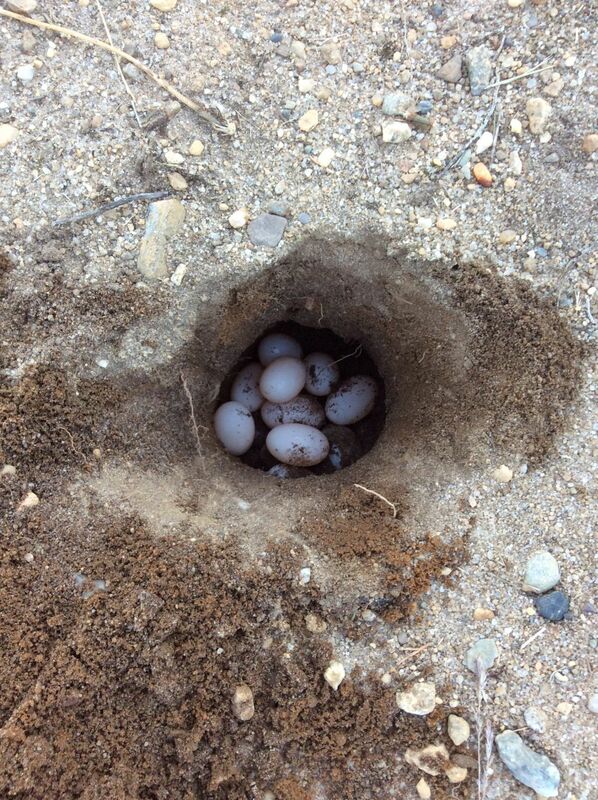 In Eastham, another big terrapin town, 178 nests were found (9 depredated). Now, the bad news. This summer, the terrapins of Wellfleet Bay met their greatest challenge crossing busy roadways. 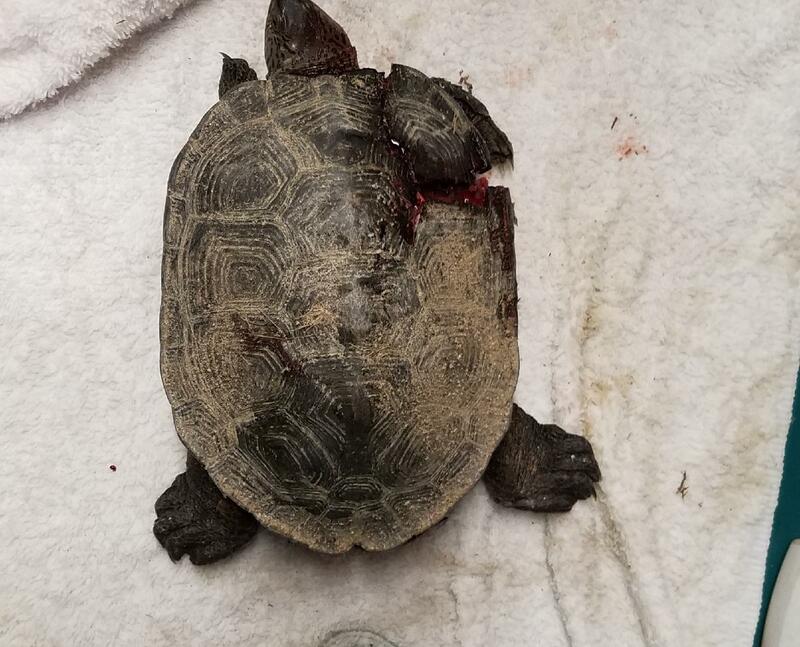 Eight turtles were run over in Wellfleet and 11 were hit in Eastham with the highest incidents at Bridge Road and Samoset Road. That makes a record 19 terrapins that were run over by cars during the nesting season this year. Unfortunately, only one of those nineteen turtles survived. Without some intervention it’s a problem that may only get worse. The more nests that successfully hatch and send young turtles into the world, the more that will manage to reach adulthood to reproduce. And, increasingly, more of those adult females will be run over given our heavily developed shorelines. It’s a trend that threatens to reverse all the progress made in rebuilding the population. With the 2018 turtle nesting season behind us, Wellfleet Bay has committed to devoting staff time to developing plans to mitigate hit-by-car turtles. We’ll be reviewing methods that have had success elsewhere, surveying the local roads where the most incidents occur, and working with towns and residents on a plan to direct nesting turtles away from traffic. 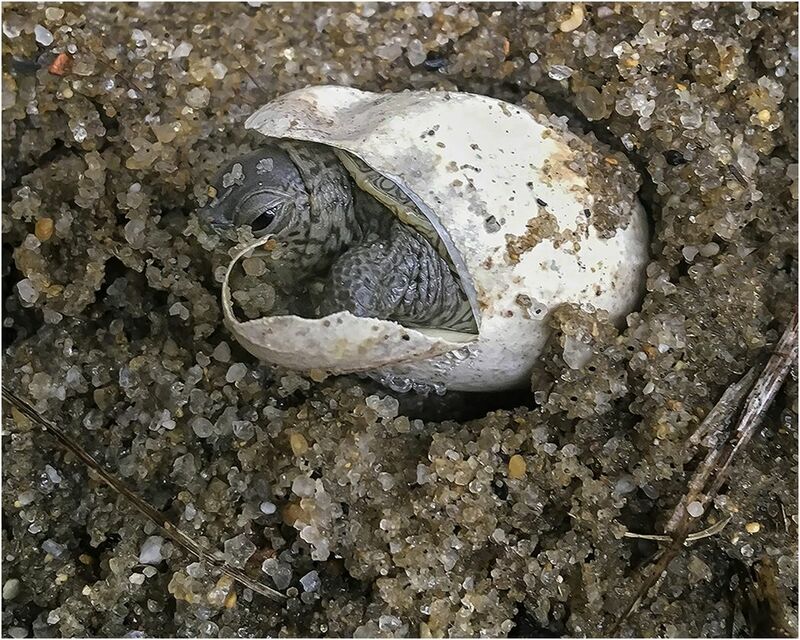 Despite the high turtle death toll on the road, the staff and volunteers at Wellfleet Bay Wildlife Sanctuary have reason to believe some eggs salvaged from unlucky turtles may still hatch. This year we were able to remove eggs from 5 of the turtles that were hit on the road. We remain hopeful that despite their trauma, these eggs will show the resilience so often seen in turtles and will produce healthy terrapin hatchlings. If you should happen upon any turtle attempting to cross a road, if safe for you, please help her cross safely. Moving her across the road in the direction she was heading can save her life and the lives of the countless eggs she is yet to produce. Female terrapins lay two clutches of 8 to 14 eggs each year. Saving just one terrapin can add up to 28 hatchlings each year that she lives–as many as 600 in an average lifetime– and could make the difference in the diamondback terrapin’s fight for survival in Wellfleet Bay. This post was contributed by Maureen Duffy, a marine biologist, who heads the Wellfleet Bay diamondback terrapin team. Maureen also will be leading the sea turtle rescue team this fall. This entry was posted in Updates on July 27, 2018 by Wellfleet Bay. How does a person safely move a turtle across a road? Is it okay to pick it up? If you can pull the car over on the side of the road and if it’s all clear, then you get out and pick up the turtle. A terrapin may wiggle its legs a bit but you can just put one hand under its bottom shell to stabilize it. Then, you can either take it the direction it was heading OR, if you have the time, call the wildlife sanctuary and we’ll meet you and take to the turtle to a safe nesting spot or back to the marsh. If you see a box turtle or painted turtle crossing a road, you can just take them to the side of the road where they were heading. Turtles are stubborn and if you don’t take them where they want to go, they’ll turn around! Thanks so much for your interest and concern! Yes, It is absolutely okay to pick up a turtle in the middle of a road. Typically you want to hold a turtle from the back or sides, away from the mouth. When a turtle is crossing the road and you pick it up, you ALWAYS want to move it in the direction that it was initially heading in. If you don’t the turtle might try to cross again. Support our sea turtle rescue efforts!